•The property is ideally located for those who enjoy being in the heart of a bustling town and close to all the amenities that Torrevieja has to offer. There are many shops, restaurants and bars all within walking distance. •Torrevieja boasts an array of activities, including horse riding, Go karting, Tennis, Wind Surfing, Snorkelling, Scuba-diving, Paintball, Ballooning, Safari Park, Bowls, an Aqua Park and the most popular being golf. There are several golf courses around Torrevieja. One of those being the La Manga course where England and several professional football clubs have stayed, other courses include… Villa Martin, Las Ramblas and Campoamor. •A Theme Park similar to Alton Towers is an hours drive away. •Next to the Marina you will find a fabulous “fair” open in the summer evenings, this will keep the kids excited for hours. •For those who enjoy clubbing and dancing the night away the resort boasts an array of nightclubs and bars to keep those feet tapping. 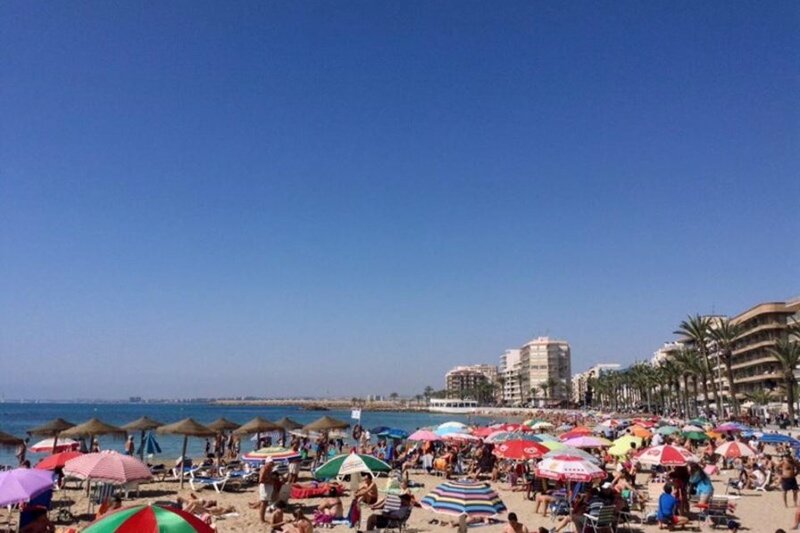 •Torrevieja is a very cosmopolitan resort. •Torrevieja is located on the Costa Blanca on the Mediterranean coast 35 minutes drive south of Alicante Airport, 35 minutes drive north of Murcia Airport. Transfers can be arranged. •The apartment is on Cala Corbetta, a side street approximately 150 metres from the beach, the Playa del Cura. •Bars and restaurants overlook the pedestrianised sea front. A wide variety of cuisine is available, all at very reasonable prices. •Beaches are of soft white sand and have been sectioned off by the construction of sea walls in natural stone for safer bathing for children. •Further in the town you will find a splendid choice of shops, including indoor and open markets. Most of the popular Bars & Restaurants, are found on the pedestrianised sea front, however, numerous excellent restaurants are located in side streets. Pizza No 1Avd Los Marineros.